It's time to go to sleep...but there are so many technological distractions. I saw this when I was in a book store with my Mum. We read it then and there. The copy we read was a donated book and we were leaving - but I bought this book as soon as I could. I'm glad I did. It's wonderful. It had been years and years since I'd read 'Goodnight Moon' and all of my (or rather, most likely my brother's) picture books are packed up in storage back in New Zealand. I wish they weren't because I am finding picture books more and more fascinating. Since I didn't have my own copy of 'Goodnight Moon', I did what was natural and read an in-store copy. It's amazing how this parody has taken the same style of illustrations and details and modernized them. Mice now robots, kittens now expected to do things and everything electronic. I noticed that while 'Goodnight Moon' had black and white illustrations when there wasn't two-page spreads, 'Goodnight iPad' had vibrant colour all the way through. I find this parody version quite preferable to the oringal. I suppose because I can relate more to staying up into the night playing Angry Birds and listening to audio books on my tablet than I can to mush. Ew. 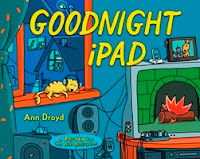 'Goodnight iPad' is a great read and a must-own book. I found it strange that I had to go to the Humour section in the store to find it. It should be available in the Children's picture book section. After all, these days five year old kids have Blackberrys and cats have iPads. Note: I love how they have tons of expensive gadgets but everyone has to either share a bed or sleep on the floor. In accordance with the FTC, Quill Café would like to disclose that the reviewer purchased this book. The opinions expressed are hers alone and no monetary compensation was offered to her by the author or publisher. Cover art is copyright of Blue Rider Press and is used solely as an aide to the review.